An undeniable disaster...of marketing. Join me on a tour of media headaches, and why they don't necessarily reflect the quality of the movie itself. 132 min. Walt Disney Pictures. Director: Andrew Stanton. Cast: Taylor Kitsch, Lynn Collins, Willem Dafoe, Ciaran Hinds, Mark Strong, Dominic West, Samantha Morton, James Purefoy, Thomas Haden Church, Daryl Sabara, Bryan Cranston. Sometimes the Hollywood game is all about managing expectations, and in that sense, Disney's John Carter was an undeniable disaster...of marketing. Join me on a tour of media headaches, and why they don't necessarily reflect the quality of the movie itself. Pre-release rumors claimed a runaway budget north of $300 million, prompting first-time live-action director Andrew Stanton (WALL•E) to respond to the "complete and utter lie" of an overrun: "I want to go completely on record that I literally was on budget and on time the entire shoot. Disney is so completely psyched that I stayed on budget and on time that they let me have a longer reshoot." While costly reshoots and poor box-office receipts mean Disney's fiscal investment in John Carter was a poor one highly unlikely to spawn a franchise, the resulting film boasts impressive production design (by The Dark Knight's Nathan Crowley), appealing desert location footage (shot in Utah), and special effects, including lively CGI characters. Then there's the title change from "John Carter of Mars" to the generic John Carter (widely believed to be the suits' response to the Disney-released mega-flop Mars Needs Moms). Based on Edgar Rice Burroughs' 1917 novel A Princess of Mars, the finished John Carter does a creditable job of wrangling a sprawling story, one that originally appeared in pulp serial form. Yes, the title change is stupid and embarrassing, but has no bearing on the quality of the film itself, which unfolds not unlike a compressed film serial: pulpy, action-packed, and well aware it's looser-limbed science fantasy rather than science fiction. Movieline, after The Hollywood Reporter, reported that "even after putting together a first cut Stanton was rewriting major character arcs and story sequence...then rearranged key character reveals and scenes." That admittedly worrisome account reflects a lack of narrative foresight that clashes with Stanton's statement on the home-video featurette "360 Degrees of John Carter": "You cannot get away with not knowing what you want when you tackle something like this." The script credited to Stanton, Mark Andrews and Pulitzer Prize winner Michael Chabon is hardly perfect, but it's mostly coherent (a victory in itself) and just irreverent enough to make the material function, framing the Mars story with Burroughs (Daryl Sabara) himself as the young nephew of his hero: a former Confederate Army captain (Taylor Kitsch of Friday Night Lights) accidentally transported to the red planet, where he finds his strength has been multiplied and he can leap wide expanses in a single bound. It's a fine line between taking this story too seriously or not seriously enough, and the film walks it fairly well. Approach it as pulp, and the lavish 3D epic is quite engaging enough for a pass. Dull patches in the film's saggy midsection mar the otherwise busy plot, the business about a Ninth Ray to rule them all never makes much sense, and the rounded-vowel repetitions of "Barsoom" (the true name of Mars) and "Jasoom" (Earth) do induce unintentional giggles. The six-legged space dog Woola, a full complement of airships, and a gladiator sequence pitting the ever-bare-chested Carter against white-furred, fanged giant apes evoke Star Wars on its bad days, but then Burroughs was a formative influence on Lucas. The "Princess of Mars" has been upgraded as smart and battle-ready Dejah Thoris (Lynn Collins), plummy-toned regent of the Royal Helium Academy of Science. Though caught up in a politically expedient marriage arrangement, Dejah proves to be more than a passive beauty. Stanton and his co-writers also weave in liberal anti-war and pro-environment sentiments to give the silliness some weight. In 1868, Carter angrily tries to keep his Civil War past behind him, refusing to help one Colonel Powell (Bryan Cranston) fight the Apaches: "We're nothing but a warring species, and I want no part of it." When a space-travel medallion plops him on Mars, Carter finds more of the same. The nine-foot-tall, tusked, green, four-armed tribal Tharks—led by "jeddak" Tars Tarkas (performance-captured Willem Dafoe)—protect their way of life from warring urbanites: civil-warring "predator city" Zodanga (a red state under Dominic West's Sab Than) and Helium (a blue state under Ciarán Hinds' Tardos Mors, Dejah's dad). The war is being engineered by a bald string-puller, an eternal Thern named Matai Shang (Mark Strong). When this sinister cool cat tells Carter, "We don't cause the destruction of a world, Captain Carter. We simply manage it, feed off it, if you like...Populations rise, socities divide, wars spread. And all the while, the neglected planet slowly fades," it's not hard to conjure a certain modern-day neo-con. So John Carter turns out to be a rather typical modern genre blockbuster: arguably better than fair and less than good, but certainly watchable. Good actors (including Rome alums Hinds, James Purefoy, and an offscreen Polly Walker for that extra British costume-drama dash) and expensive visuals energize the picture, which perhaps never should have been made, may have been made irresponsibly, and stars a talent for whom the box-office jury's arguably come in with a conviction (Kitsch's Battleship has also been branded an epic flop). Stanton's live-action filmmaking career may prove unsalvageable, but the bad press doesn't tell the whole story. All opinions aside, Stanton can take comfort in one thing: he got the damn thing made, and as the saying goes, "Pain is temporary. Film is forever." 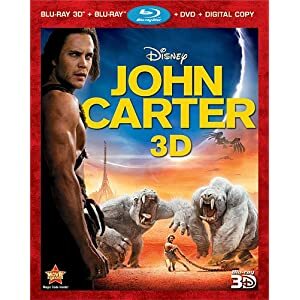 Disney doesn't skimp on its home-video release of John Carter, offering up a Blu-ray 3D + Blu-ray + DVD + Digital Copy special edition (as well as Blu-ray + DVD combo and DVD-only releases). Though John Carter is a 3D "conversion" rather than native 3D, it's worth ponying up for the state-of-the-art 3D combo pack. The technically impressive high-def transfer pops nicely in sunlit scenes and succeeds in achieving a ViewMaster-style depth of field. The effects proves strongest, of course, when the imagery is primarily CGI, and weakest when the characters chat in dark caves, but on the whole, it's a satisfying 3D presentation (I noticed only very rare and mild crosstalk for a few seconds of the two-hour-plus running time). The 2D hi-def transfer that's included on its own disc has its own brand of depth, with razor-sharp detail and lush color on par with the 3D presentation, and the DTS-HD Master Audio 7.1 surround mix offered on both hi-def discs is plainly perfect, pinpoint detailed and wildly effective at immersing the audience into the worlds of the film.. The Blu-ray disc houses most of the extras. There's a wall-to-wall screen-specific commentary by director Andrew Stanton and producers Jim Morris and Lindsey Collins that gets into the film's long history and complex production. Another viewing option is to "Explore John Carter's Journal with Disney Second Screen," the interactive app that syncs your wi-fi device to the film to present complementary content. "100 Years in the Making" (10:43, HD) concisely gives some background on Burroughs, his Barsoom series, and the multiple attempts to get it to the screen, with comments from Stanton, Jon Favreau, co-screewriter Michael Chabon, The Barsoom Project author Steven Barnes, astrophysicist Dr. Neil Degrasse Tyson, Willem Dafoe, philosophy professor Dr.Robert Zeuschner, production designer William Stout, producer Jim Morris, and Taylor Kitsch. Ten "Deleted Scenes" (19:02, HD) come with an introduction and optional commentary by Stanton. "360 Degrees of John Carter" (34:32, HD) is a day in the life of the production. Naturally, it's one that makes the production look like a well-oiled machine (seemingly only one shot is dropped from the day's schedule). It's a fascinating look at big-budget filmmaking: the set is like a private theme park for cast and crew, and one can sense the invisible money counter flipping upwards as we absorb the size of the production. On-camera participants include Stanton, second assistant director: crowd Samar Pollitt, Lynn Collins, makeup designer Bill Corso, costume designer Mayes Rubeo, "Zodangan Soldiers" Katie Cecil and Faisal Abdalla, visual effects supervisor Peter Chiang, third assistant director: crowd Fraser Fennell-Ball, assistant stunt coordinator George Cottle, stunt coordinator Tom Struthers, "Heliumite Soldier" Douglas Robson, writer/second unit director Mark Andrews, catering assistant Jay Devins and craft service Magdalena Surma, Dafoe, Mark Strong, set production assistant Toby Spanton, swordmaster Kevin McCurdy, Kitsch, and Kitsch's stunt double Mark Mottram. In perspective of the production, "Barsoom Bloopers" (1:56, HD) seems strangely brief, but it's a welcome addition to round out the set. All site content © 2000-2019 Peter Canavese. Page generated at 04/17/2019 10:17:44PM.